Last month, I was in the middle of cleaning out my fabric when I stopped to catch up on some email. I subscribe to a blog called Ninth Street Notions, which caught my eye a while back because she’s a fellow Oregonian. She was organizing a Fat Quarter Swap and asked that interested readers sign up. It seemed like good timing, what with me sitting in the middle of all that fabric. If you’re unfamiliar with the term “fat quarter,” it just means a piece of fabric that measures 18 x 22”. It’s a lengthwise half of a half yard. I was assigned another crafter, who happened to be from New Zealand. I sent this package her way. And received this fun little bundle. My daughter immediately spotted the chevron print, so I set that aside, along with the turquoise, for a project for her. The black and white harlequin actually has little gold lines in it, which made it coordinate well with my favorite of the bunch, the brown and gold floral print. I have projects to show you throughout the week made from each of those, but we’ll start with the blue and tan checkers in the corner. I’ve been interested in trying to make fabric postcards for a while now, and since featuring them in my Friday Favorites recently, it’s been closer to the top of my list. I signed up for Postcrossing, also from that round-up, and was been assigned a recipient from Spain. It was time to get cracking and that print seemed perfect. My postcard pal requested something that reflects where I live. 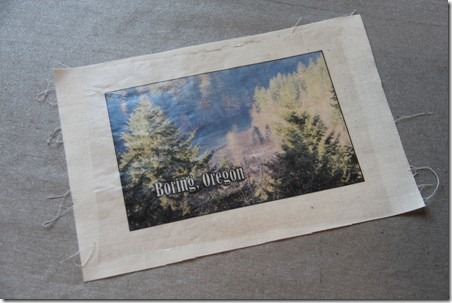 Good luck finding a “Boring, Oregon” postcard. They might be out there somewhere, but I’ve never actually seen one. This was about making a card anyway, so I decided to get a little creative. I took a photo of my back yard, which is technically a valley with a river in the bottom. I printed that on a piece of muslin using the freezer paper method. I was concerned about the ink getting wet and smearing in transit, so I used some fusible vinyl to cover the photo. I also printed some postcard backs on cardstock. I used a bit of fusible adhesive to attach the fabric to the back of the postcard. I cut strips of the print on the bias (diagonal) and sewed them together until I had enough to go around the outside of the card. I folded that in half, then folded one edge into the fold and pressed, so I had something resembling half-finished bias tape. I folded one end under, then stitched it to the card with the raw edge even with the edge of the card. I trimmed the edges of the card, rounding the corners, then rolled the fabric over the edge to the back. I sewed around the edge through all the layers with a zigzag stitch. I’m pretty happy with the way they turned out, even though they do NOT want to lie flat. The good news is, my recipient obviously collects the cards, as he requested I mail it in an envelope if possible. I can’t imagine sending this through the mail as is, but I know others do. I really love the fabric on the edge. Stay tuned this week for more fat quarter projects!